Your favorite hunter loves hunting more than work. Let them display their true feelings at home or at work with these unique Hunting Customizable Coffee Mugs. Our Personalized Mugs are Dishwasher safe and hold 11 oz. Includes FREE Personalization! 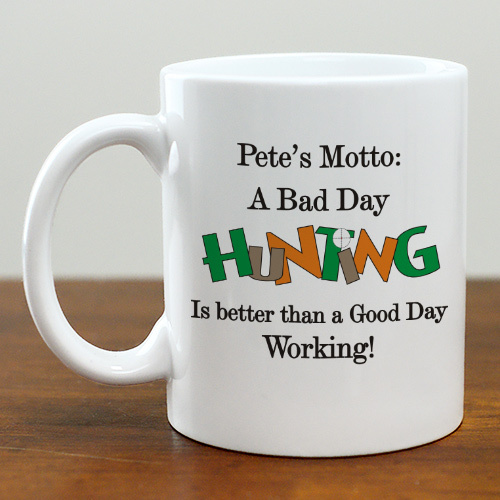 Personalize your Bad Day Hunting Coffee Mug with any name. Personalization was wrong but the csr promised to correct and get the new product to me in 3 days to have by Valentines since this was a gift. Be sure to look at our entire collection of Personalized Fishing And Hunting Gifts for Him. These Personalized Fishing & Hunting Gifts are perfect gift selections for Birthdays, Father's Day, Anniversaries & the Christmas season.